Management guru Peter Drucker says that we can’t manage what we can’t measure. To be able to manage our productivity, we need a way of gauging where we’re at in terms of our pro-activity and productivity. Understanding and being able to see our life through this model of 3 Levels of Living will help us do that. People who live on this level have no productivity because they spend their time worrying about the things that they have no control over, focusing on the things that are not working and complaining, blaming, naming and shaming everything and everyone else around them for their ‘problems’. They are heavily invested in their ‘stories’ instead of their future. A ‘story’ is something that we tell ourselves to justify why we can’t change and why we can’t be productive. For instance, “I can’t be productive because I have to take care of my family”. Or, “my health is stopping me from doing what I want”. They ‘hope’ and ‘wish’ for things to get better while giving ‘reasons’ as to why they can’t take action to move towards the way they want things to be. They blame their past, their parents, their boss and everyone else for why they are the way they are. They play the victim in every situation. People who live on this level have some productivity because they do take responsibility for their life, in most of the areas. They might have some areas of their life that they invest in stories – reasons why it’s hard to change and be productive – but they also have areas of their life that they take responsibility for, especially, the areas that they’re confident about and are good at. For example, ‘I’m on top of my work, but marriage, it’s just the way it is’. They might do one or two personal development or productivity courses once in a while and try to implement and improve their life but then find themselves going back to the same old, same old. Their actions are inconsistent and hence, lead to inconsistent results. People at this level enjoy full productivity because they realise that they’re either part of the problem or part of the solution, so they spend their time and energy to be part of the solution. They focus on what they have control over and can influence. They hold themselves 100% responsible for the results that they get, regardless of what the result might be. They realise that indulging in blame or justification equates to simply wasting the opportunity and power to affect change. They don’t take things personally and they acknowledge that everyone is doing the best they can. They are very forgiving and always grateful for the situations that they find themselves in because they know that these are opportunities to learn and grow from. They believe in Allah ’s promise that He doesn’t test them with anything that they can’t bear. They see problems as tests that they want to overcome to get to the next level of productivity and living. 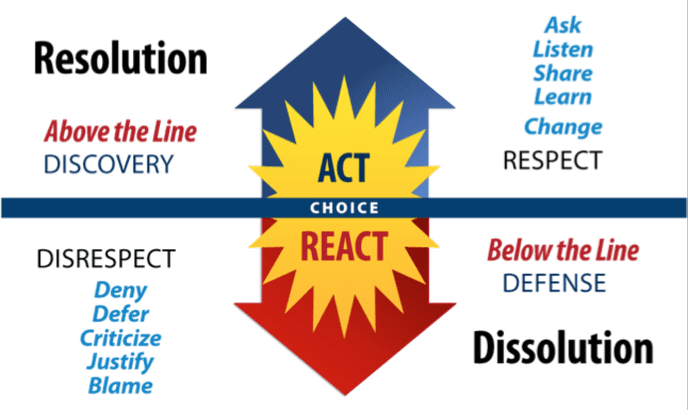 Another way to look at the three levels is from the view of whether someone is living above the line or below the line, being at cause or at effect. Remember that playing above the line means being proactive, taking 100% responsibility for everything that goes on in our life and focusing on what we can control and influence. Another way of looking at the three levels is through the stages of child, adolescent and adult. Children are very dependent, want everything done for them, no responsibility, all fun, won’t do anything that’s not fun to do and can be very immature. Adolescents would take responsibility in some areas but other areas, they’ll want to escape and be rebellious. They will be motivated to do certain things while procrastinate about others. Adults take full responsibility of their life and understand that ultimately it’s about growth, contribution and building something worthwhile to leave behind – a legacy. So, we’ve covered the 3 Levels of Living and how you can gauge and maximise your productivity by constantly striving to live at Level 1 by having goals and productive rituals. In the next article, we’ll learn about the critical mindset on learning and productivity.